I have been wanting to try and recreate my own stuffed spaghetti squash since having it for lunch at Butcher and Bee a few weeks ago. I have only cooked spaghetti squash one other time and I don't know why but it intimidated me. However it simply could not be easier to roast. After cooking it this time and seeing how easy and delicious it is, I will be cooking this more frequently. You could use any sort of veggie topping you want. I kept mine pretty simple with just greens, mushrooms and goat cheese. Even my kids ate this- shocker. I only made two halves one for me and Matt because I figured they would snub their noses at the greens. Well Sterling gobbled up the greens and mushrooms on top and Frances ate the plain noodles. I am always happy when my kids branch out and try new things. I drizzled ours with pesto for some extra flavor and it really made the flavor pop. You could even add fresh grated Parmesan as well. So many different toppings options. Cut the spaghetti squash in half and scoop out all the seeds. Brush both sides (the flesh side not skin side) with olive oil and salt and pepper. Place them face down on a baking tray (you want the skin side up). Roast at 350 degrees about 40-45 minutes until you can easily prick through the skin with a knife. Remove from oven and let cool. Meanwhile heat 1 tablespoon olive oil in a skillet and add baby mushrooms. Saute a few minutes until they shrink some. Add in fresh spinach and arugula and cook just a minute until greens are slightly wilted. Take a fork and run it over the flesh of the squash making it into thin noodles. Leave in shell. Scoop on mushroom and greens mix and season all with salt and pepper. Drizzle with pesto and add crumbled goat cheese. 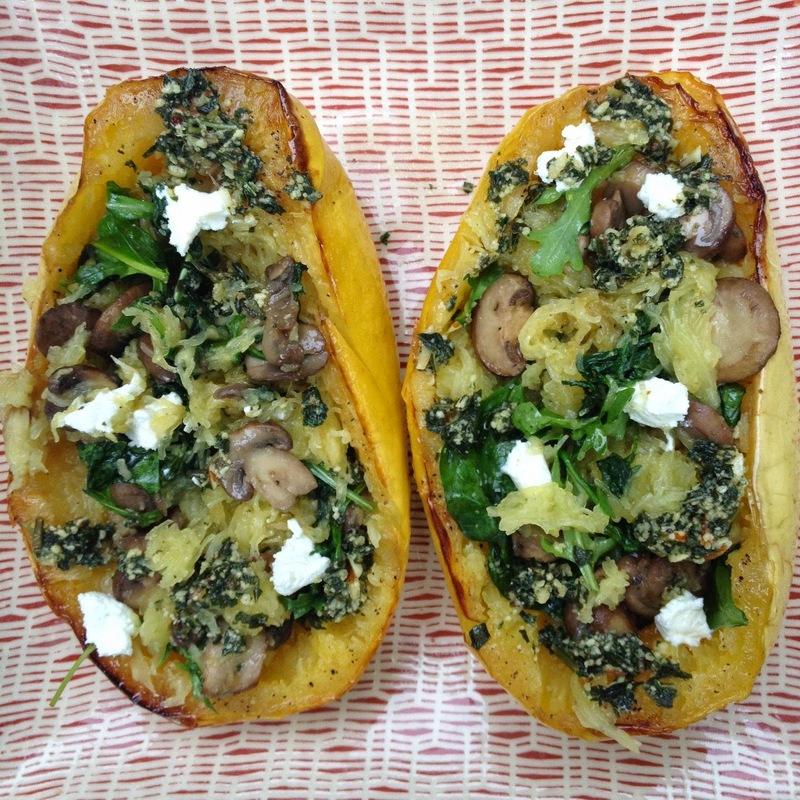 I have a spaghetti squash obsession! I made an amazing & simple buffalo chicken version a couple of weeks ago!